OK, OK, I just heard a cool YOUTUBE Video of CYNDI LAUPER and JONNY LANG doin' 'How Blue Can You Get? '....I've always knew JONNY LANG meant BLUZZZ, so, thought I'd give it a try... But wait...CYNDI LAUPER? Yes...A BIG YES. 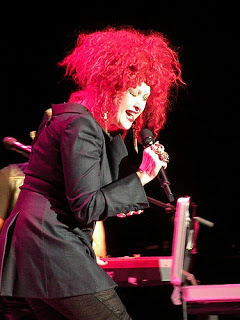 CYNDI LAUPER now means that bold powerful, heart-felt, crying kinda BLUZZZ. Yea Cyndi. I just loved it. I'll post it below. Last summer, CYNDI LAUPER released her latest Album, called MEMPHIS BLUES, it has this tune on it and so many fabtastic BLUZZZ things on it...so, it must be just awesome. Check it out all you bluzzz lovers. OK? Link HERE. To learn more 'bout CYNDI LAUPER's life, go HEREfor her Bio. Here's that YOUTUBE video. CYNDI LAUPER and JONNY LANG doing 'How Blue Can You Get?'. Music Going Ons 'Round Town...What's Up?